OTTAWA -- Dozens of people gathered in an Ottawa community centre Monday to learn more about the federal government's proposed multimillion-dollar settlement for survivors of the '60s Scoop -- and why they should reject it. 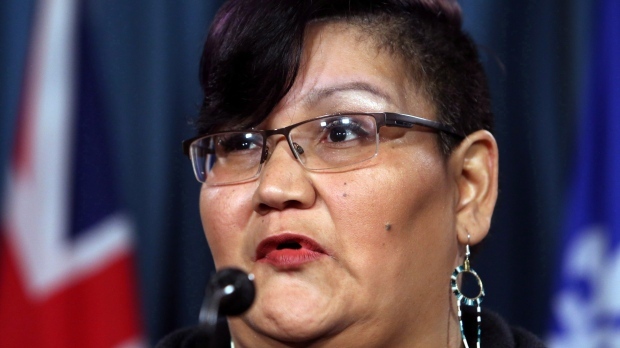 The National Indigenous Survivors of Child Welfare Network arranged the information session to scrutinize the $800-million deal, which was announced last October but has yet to receive court approval. "There are so many things that are wrong with this," network co-founded Colleen Cardinal told the gathering, made up in part of survivors and supporters. "It's really important that this information gets out there, by survivors for survivors," she said. "The federal government is not going to make sure that every survivor knows what their rights are. Our mission is to get out there and let people know what is happening." The '60s Scoop saw thousands of Indigenous children taken from their homes by the federal government and placed with non-Indigenous adoptive and foster families across the country starting around the 1950s. The government's compensation proposal includes $50 million for an Indigenous Healing Foundation. Cardinal denounced the deal, saying the federal government should have first asked survivors what they wanted. "They don't even know how many survivors there are," Cardinal said, disputing the estimated $20,000 to $50,000 payment per person. Cardinal also criticized the settlement for excluding survivors who are Metis and non-status Indians. The office of Crown-Indigenous Relations Minister Carolyn Bennett has said the proposed settlement is a first step and the government is committed to using negotiation to resolve any ongoing litigation. "We know that there are other claims that remain unresolved, including those of the Metis and non-status," she said a statement from her office. An Ontario Superior Court judge will hear arguments in Saskatoon and Toronto in May on whether the proposal should be approved. If the settlement is allowed to proceed, the network will push for at least 2,000 survivors to opt out in an effort to void the deal. But the government could still push ahead regardless of how many people say they don't want to be part of the settlement, lawyer Brian Meronek told the gathering. There is also no guarantee that provinces won't revoke income assistance payments if someone becomes ineligible after receiving a settlement payout, said Meronek, who represents a group in Manitoba that opposes the settlement. Cardinal and other organizers have warned survivors to be wary after hearing reports of some lawyers offering to help navigate the settlement in exchange for exploitative contingency fees. The network is a survivor-led organization based in Ottawa founded in 2014 that offers information and support for survivors. The group has 300 members, and Cardinal said it reaches thousands more online, through its toll-free number and via presentations and gatherings. The network is also involved in two research projects, the first by Raven Sinclair at the University of Regina about the experience of the '60s Scoop survivors, using interviews and archival research. The second is a geographic information system that maps the diaspora of survivors, including their origins and where they were placed.